‘Doctor’ Colleen Huber (DCH) is the US naturopath who is currently suing Britt Hermes. For me, this is enough reason to do a bit of reading and find out who DCH is and what motivates her. Here is what I found out (I added some * to the quotes [all in italics] and comments below). DCH has an impressive presence on the Internet. One website, for instance, tells us that DCH is a Naturopathic Medical Doctor* in Tempe, Arizona. Her clinic, Nature Works Best Cancer Clinic, has had the most successful results of any clinic in the world reporting its results over the last 9 years **. *I am puzzled by this title. Is it an official one? I only found this, and it omits the ‘medical’: Currently, 20 states, five Canadian provinces, the District of Columbia, and the U.S. territories of Puerto Rico and the U.S. Virgin Islands have passed laws regulating naturopathic doctors. Learn more about licensure from the Association of Accredited Naturopathic Medical Colleges. It seems that Arizona is the only state where the ‘medical’ is allowed. However, don’t take this to mean that DCH went to medical school. ** ‘most successful results of any clinic in the world’? Really? Where are the comparative statistics? *** the study had all of 317 patients and was published in an obscure, non-Medline listed journal. **** currently ranked #1,297,877 in Books on Amazon. ***** no such entries found on Medline. ****** sorry, but my Medline search for ‘huber colleen’ located only 2 citations, both on arthritis research conducted in an US Pfizer lab and therefore probably not from ‘our’ DCH. * Give me a break! Vitamin-C and Baking Soda are claimed to have proved to be an effective alternative to traditional chemotherapy and radiation ? I would like to see the data before I believe this! ** Again, I would like to see the data before I believe this! I don’t know about you, but I am not impressed. Surviving cancer patients had 24.0 points higher mean total cholesterol than the mean for deceased cancer patients. Has DCH thought of the possibility that moribund patients quite simply eat less? In which case, the observed difference would be a meaningless epiphenomenon. At this point, I stopped my reading; I now knew more than I needed to know about DCH (if you want to read more, I recommend this or this post). As I mentioned at the beginning of this post, DCH is currently suing Britt Hermes for libel. Apart from being exceedingly stressful, such an action can also be hugely expensive. Britt is therefore hoping to do some crowd-funding to assist her financially. I wish my post has motivated you to donate generously. For advocates of alternative medicine, Hatch’s retirement comes as a blow: for decades, the senator has been one of the most powerful defender of quackery. As a young man, Orrin Hatch sold vitamins and supplements. As an old man, he takes them every day—including. “I really believe in them. I use them daily. They make me feel better, as they make millions of Americans feel better. And I hope they give me that little added edge as we work around here”, he was quoted stating. And his love was returned: Between 1989 and 1994 Herbalife International gave Hatch $49,250; MetaboLife, $31,500; and Rexall Sundown, Nu Skin International, and Starlight International a total of $88,550. In addition, according to his financial disclosures for 2003, Hatch owned 35,621 shares of Pharmics, a Utah-based nutritional supplement company. In the early 1990s, Hatch’s son Scott began working for lobbying groups representing vitamin and supplement makers. Kevin McGuiness, Hatch’s former chief of staff, was also a lobbyist for the industry. “Mr. 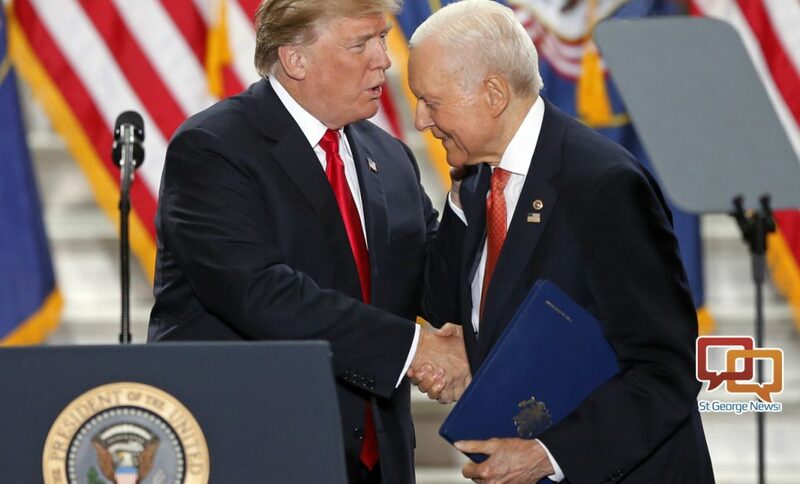 Hatch has been rewarded with hundreds of thousands of dollars in campaign contributions, political loyalty and corporate sponsorship of his favorite causes back home. Hatch’s son Scott Hatch is a partner and registered lobbyist at Walker, Martin & Hatch LLC, a Washington lobbying firm. The firm was formed in 2001 with Jack Martin, a staff aide to Hatch for six years, and H. Laird Walker, described as a close associate of the senator. In March 2003, the Los Angeles Times reported that the firm was formed with Hatch’s personal encouragement and that he saw no conflict of interest in working on issues that involved his son’s clients. In 2009, the Washington Times reported that Hatch said “My son, Scott, does not lobby me or anyone in my office”. it is gone after about a week, treated or not. There was great excitement in the 1970s when Linus Pauling, (a Nobel laureate twice over), concluded from placebo-controlled trials that Vitamin C could prevent and alleviate the common cold. Further research followed and a Cochrane review, published in 2013, found 29 clinical trials, involving 11,306 participants. Unfortunately, the review did not confirm Pauling’s findings. Taking regular Vitamin C did not reduce the incidence of colds in the general population, although there was a modest reduction in the duration and severity of symptoms. The only people who appeared to derive some benefit were those who undertook short bursts of extreme exercise, such as marathon runners and skiers. In this group the risk of getting a cold was halved. Trials looking at taking high dose Vitamin C at the onset of cold symptoms showed no consistent effect on the duration and severity of symptoms and more research is needed to clarify these findings. Echinacea is widely used in Europe and North America for common colds. A Cochrane review (2014) showed that some Echinacea products may be more effective than placebo in treating colds but the overall evidence for clinically relevant effects was weak. There was some evidence of a small preventative effect. Inhaled steam has been used for decades (see earlier reference to my childhood humiliation!) thinking that it helps drain away mucus more effectively and possibly destroys the cold virus. A Cochrane review (2017) of six trials with 387 participants showed no consistent benefit for this intervention. The article obviously focuses only on such therapies for which Cochrane reviews have been published. What about other treatments? As I already mentioned, if we believe the promoters of alternative medicine, the list is long. But fortunately, we do not believe them and want to see the evidence. Unsurprisingly, the evidence is not good. One of my posts even expressed the fear that it might involve scientific misconduct. Yes, some chiropractors claim that their manipulations are effective for the common cold. But, as with almost all of their claims, this cannot be taken seriously; the assumption is bogus. A systematic review concluded that their use for common cold is not supported by robust evidence. Twenty-five volunteers were submitted to sauna bathing, with 25 controls abstaining from this or comparable procedures. In both groups the frequency, duration and severity of common colds were recorded for six months. There were significantly fewer episodes of common cold in the sauna group. This was found particularly during the last three months of the study period when the incidence was roughly halved compared to controls. The mean duration and average severity of common colds did not differ significantly between the groups. It is concluded that regular sauna bathing probably reduces the incidence of common colds, but further studies are needed to prove this. Sadly, the findings were never replicated. This makes it abundantly clear that, for some, the Internet can become a danger to their health and life. Recently I was reminded of this fact when I saw this website entitled ‘Foods that will naturally cleanse your arteries’. Its message is instantly clear, particularly as it provides this impressive drawing. Salmon is one of the best heart foods as it is packed with healthy fats which reduce cholesterol, triglycerides, and inflammation. However you must make sure that the fish is organic. Orange juice is rich in antioxidants which strengthens the blood vessels and lowers blood pressure. Simply drink 2 glasses of fresh orange juice a day and you’re good to go. According to numerous studies 2-4 cups of coffee a day can significantly reduce the risk of stroke and heart attack by 20%. However don’t drink excessively as it may cause problems with your digestion. Nuts are packed with omega-3 fatty acids, healthy properties and unsaturated fats which regulate your memory, cholesterol and prevent joint pain. Curcumin, the active ingredient in turmeric provides a large variety of health benefits. It helps reduce tissue inflammation and prevents overactive fat accumulation. Feel free to add it to your meals or to your tasty cup of tea. Aside from having a soothing effect, green tea helps energize the whole body, boost the metabolism and lower the absorption of cholesterol. Just drink 1-2 cups of green tea a day and you have nothing to worry about. Cheese can also help lower blood pressure and cholesterol. Watermelon is the most delicious summer fruit. But aside from its amazing taste, it also improves the production of nitric oxide which enhances the function of the blood vessels. Whole grains are rich in fiber content which helps lower cholesterol and cholesterol accumulation in the arteries. Consume more whole grain bread, brown rice and oats. Cranberries have been long known to be the richest source of potassium. Due to this, they can easily lower bad cholesterol and increase the good one. 2 glasses of cranberry juice a day can lower the risk of heart attack by 40%. Seaweeds are packed with vitamins, proteins, minerals and carotenoids which easily regulate your blood pressure. Cinnamon prevents buildups in the arteries and lower cholesterol. It is an exotic fruit that provides a healthy portion of phytochemicals. These improve the production of nitric oxide, and boost circulation. Add pomegranate seeds to your salads. It is high in folic acid and potassium. You need this to lower your blood pressure, strengthen muscles, and prevent heart attack. Broccoli is rich in vitamin K, which help lower blood pressure and cholesterol when eaten steam-cooked or raw. Olive oil helps maintain your health at its peak. Be sure to use cold-pressed oil as it is rich in healthy fats which lower cholesterol and reduce the risk of heart attack by 40%. Asparagus prevents inflammation, clogging and lowers cholesterols. Implement it to dishes, noodles, soups or potatoes. Blueberries are high in potassium and as we mentioned above, potassium is the key to reducing bad cholesterol and increasing the good one. Drink 2 glasses of blueberry juice a day. Avocadoes are without a doubt – one of the healthiest fruits known to man. They’re rich in healthy fat and improve the balance of bad and good cholesterol. As far as I know, there is no good evidence for the claim that any of these 20 foods will clear arteriosclerotic arteries. There is some evidence for fish oil and some for green tea to reduce the risk of cardiovascular disease. But surely, this is quite a different matter than reversing atherosclerotic plaques. What’s the harm? I believe the potential for harm is obvious: people at high risk of suffering a major cardiovascular event who read such nonsense and believe it might think they can abandon the treatments, drugs and life-styles they have been advised to follow and take. Instead they might eat a bit more of the 20 ingredients listed above. If they did that, many would die. I think many of us who know better have become far too tolerant of dangerous nonsense of such nature. We tend to think that either nobody is as stupid as to follow such silly advice, or we assume that taking a bit of daft advice will not do much harm. I fear we are wrong on both accounts. Ascorbate (AscH–) functions as a versatile reducing agent. At pharmacological doses (P-AscH–; [plasma AscH–] ≥≈20mM), achievable through intravenous delivery, oxidation of P-AscH– can produce a high flux of H2O2 in tumors. Catalase is the major enzyme for detoxifying high concentrations of H2O2. We hypothesize that sensitivity of tumor cells to P-AscH– compared to normal cells is due to their lower capacity to metabolize H2O2. Rate constants for removal of H2O2 (kcell) and catalase activities were determined for 15 tumor and 10 normal cell lines of various tissue types. A differential in the capacity of cells to remove H2O2 was revealed, with the average kcell for normal cells being twice that of tumor cells. The ED50 (50% clonogenic survival) of P-AscH– correlated directly with kcell and catalase activity. Catalase activity could present a promising indicator of which tumors may respond to P-AscH–. The author of the WDDTY article is Bryan Hubbard. I did not know this man but soon learnt that he is actually the co-founder of WDDTY. He may not know how to spell ‘complementary medicine’ but he certainly has a lot of fantasy! His latest drivel on vitamin C for cancer seems to prove it. He seems to have the ability to extrapolate from the truth to a point where it becomes unrecognisable. The claims he makes in his article in question certainly are in no way supported by the evidence he provided as his source. This could be trivial; yet sadly, it isn’t: WDDTY is read by many members of the unsuspecting public. Some of them might have cancer or know someone who has cancer. These desperate patients are likely to believe what is published in WDDTY and might be tempted to act upon it. In other words, the totally misleading articles by Hubbard put lives at risk – and that I cannot find trivial! What doctors don’t tell you is not what WDDTY suggest; doctors don’t tell you that vitamin C reverses cancer because it is not true. In view of this and other evidence, perhaps the acronym WDDTY is not the best for this publication? Could I perhaps suggest to ‘Hubbard and Co’ another abbreviation? How about MIFUC (MisInformation From Unethical Columnists)?